‘You are a fool or you’re from far away if you don’t know Ithaca,’ says the disguised Athena to the newly returned Odysseus in Book 13. Both qualities are prominent in those who have argued that Ithaca (ancient Ἰθάκη [Ithakē], modern Ithaca [or Thiaki, Ithaki]) is not the Ithaca of Homer and myth. Locals on other Ionian Islands have also been happy to entertain notions that their island is the real Ithaca. At the beginning of Book 11 of the Odyssey the guest of the Phaeacians reveals himself to his hosts to be Odysseus of Ithaca. His brief description of his homeland is the source of some controversy. For he says that it is “low” (the usual translation of chthamale) and “towards the gloom [west].” The translation above reflects the discomfort many have found with this description since antiquity (see Strabo below), for a glance at modern Ithaca (or Ithaki) of the Ionian islands reveals that it is (besides mountainous) not the furthest west of the Ionian Islands. That would be Kephalonia, which perhaps can be equated with the Same mentioned by Odysseus. Modern Zakinthus must be the hero’s Zakynthus, but which of the other Ionian islands is Dulichium? (Lefkas, perhaps, or one of the Echinades near the coast?). Further confusion arises from a passage in the Iliad’s “Catalogue of Ships,” in which a certain Meges is said to command 40 ships from Dulichium and the Echinades off Elis, while Odysseus leads only 12 ships of “Kephalonians” who inhabited Ithaca, Neriton, Krokyleia, Aigilips, Samos, and Zacynthus, as well as the mainland opposite the islands. Neriton is elsewhere identified as an Ithacan mountain, and Krokyleia and Aiglips are often supposed to be locations on Ithaca; Samos is equated with the Same of which Odysseus speaks. What we might gather from this passage is that “Kephalonian” is a tribal name, that the islands were interconnected with the mainland, and that Odysseus was not considered the most powerful leader of the region, whatever the extent of his kingdom (perhaps only Ithaca). Puzzlement over Odysseus’ remarks has not prevented most visitors to modern Ithaca from considering it harmonious with, for the most part, Homer’s Ithaca (e.g., Gell, Leake, Schliemann, Bérard, Rodd, Luce, Cuisinier, Tzakos). But the uncertainty of Odysseus’ description of Ithaca has tempted some to cast their eyes about for the “real” Ithaca of Homer. Dörpfeld, the archaeologist who assisted Schliemann in his excavation of Troy, persisted in believing that Lefkas was Ithaca. More recently, Bittlestone has energetically argued that the Palaki peninsula of Kefalonia, in its supposedly former state as an island, was the original Ithaca. This is a variant to the Kefalonia=Ithaca conspiracy theory that has existed for over a hundred years (le Noan, Goekoop, not to mention countless internet sites purveying polemical, circular argumentation). The theorists on all sides are typically amateurs, often pressing their argument as a holiday or retirement lark. Such is also often the case for localizers of the journey of Odysseus. But Ithaca is not just another adventure in unknown seas. The Homeric poem assumes it is a known place in the Greek world. And in antiquity modern Thiaki was considered the home of Odysseus. This historical fact is not credibly challenged by the island going by different names, including ‘Dulichia,’ in a few lines of Latin poetry and sometimes in post-antiquity (see Buondelmonti for Ithaca’s various names; de Vaudoncourt well surveys the history of the Ionian Islands in the modern period). In any event, the hypothesis of Bittlestone involves Bronze Age circumstances, not the Ithaca of ancient Greek history. We are asked to believe that in prehistory the island (now peninsula) of Palaki was the original Ithaca, that Odysseus was a real person then living on this “island,” and that the Odyssey somehow reflects the Bronze Age, not the time of Homer. The Bittlestone book is therefore a non-starter, if an excellent source of geographical and bibliographical information. Some passages in Bittlestone hint at the kind of travel story amidst beautiful surroundings found elsewhere on this website, with forgivable tropes of adventure and discovery. But unfortunately the book takes itself much more seriously than that, and surprisingly many who should know better have taken it seriously as well. We agree with the concerns raised by Barbara Graziosi, who remarks, “There seem to be more pressing questions to be asked … about the relationship between scholarship, the media, and privately funded research…. it is disappointing that there has been little public debate about them.“ (JHS 128, 2008, 178-80). There has also been interest down through the ages in localizing places on Ithaca. The Odyssey’s “cave of the nymphs”, “raven’s rock”, and Arethusa spring, in particular, have excited the interest of localizers. There are actually two candidates for the “cave of the nymphs” in which Odysseus stores his treasure upon return to Ithaca. 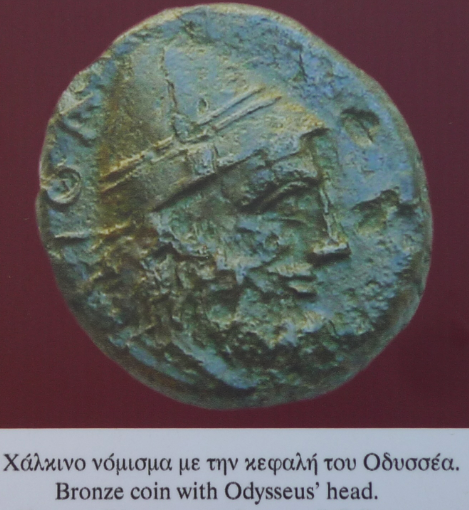 A cave by the shore of Polis Bay caused excitement when bronze tripods supposedly of the number received from the Phaeacians were discovered there, as well as cult offerings, including the Hellenistic inscription euchen Odyssei (a prayer to Odysseus). This cave is now collapsed. The other candidate is high above Dexia bay near Vathy. If it too far for even a strong hero to lug up his metal goods, it does have a small opening at the top that some compare to the “entrance of the gods” in the Odyssey description. The spring identified as Arethusa is towards the southeast of the lower half of Ithaca, near a cliff where one might happen to see a crow or two (see Luce for an engaging account of visiting such places). Archaeologists since Schliemann have been more interested in discovering the palace of Odysseus. Mt. Aitos by the isthmus was favored for a time; more recently a site on the northern half of the island has attracted attention. But though there was a Mycenaean presence on Ithaca, as more broadly in the area, no credible finds of a palace have been discovered, despite some sensational reports of this in the media (see Waterhouse and Souyoudzoglou-Haywood for reliable surveys of Ithaca’s early archaeological remains). Nor should we expect otherwise. In our view, modern Ithaca is clearly Homer’s Ithaca. On the other hand, localization of specific places on Ithaca often seems misguided. There is no reason to believe in a real, Mycenaean Odysseus, and the hero of myth, though memorable, is not described as ruling over an important kingdom. Caves, cliffs, and springs exist throughout the Mediterranean, and so it is no surprise that Thiaki-doubters have little trouble finding such “Odyssean” locales on other islands. In any event, the Odyssey’s value does not depend on precise equation with the real world. The poem does construct a coherent (if vague) spatial conception of Ithaca, which serves its own poetic purposes. Arguably the inaccuracies of Odysseus’ description, including Ithaca’s “westward” location, stem from visitation from a hodological perspective, rather than bird’s eye view. But since Ithaca and the Ionian Islands were on the outskirts of the Greek world, it is unlikely that the poet and his original audience possessed exact knowledge of the area. (For concise surveys of the question of Ithaca’s location, see Merry/Riddell or Stubbings, or the more recent Strauch). Strabo (10.2.1-12; Eng. ; Grk.) defends Ithaca as the Homeric Ithaca.